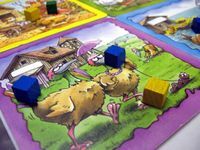 BoardGOATS is a small group of boardGamers that meet On Alternate Tuesdays in Stanford-in-the-Vale, Oxfordshire (www.boardgoats.org). We meet in the Horse and Jockey pub on the A417 (the main Wantage to Faringdon road). 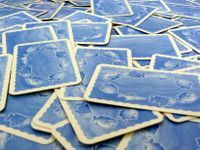 We generally prefer to play “Euro” games, but to be honest, we'll try most things once. To celebrate our first year we thought we'd put together a couple of GeekLists. The first is a copy of the meeting reports from the website and this one is a list of all the games we've played and when. If, having read the list, you think there are any games that should be high on our wishlist, feel free to add them. Well, we played a whole lot of games during the planning stages, but this was the first ever game we played when we started the club on 2nd October 2012 at the Horse and Jockey Pub in Stanford-in-the-Vale. So we managed three games on that first night and this was the second. It also hasn't been revisited, probably because the games we've been playing more recently have been a bit heavier. This was the last game we played at our first meeting. We kept it quite light to begin with because we wanted to try to encourage new gamers to come along, but well, we'll come back to that later. So, this was the first game we played in our second week. By this time we had decided that the format would be one or more light, filler-type games from 7.30pm playing something slightly longer later. This game is quite popular and we've played it a few times now, it has also been "Feature Game", but that wasn't until June. So this was our second Feature Game. 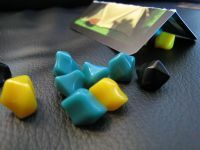 We picked it because it is accessible, plays up to seven and we thought it might interest non-gamers. 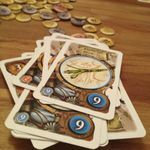 Although we quite liked it, it was probably a little bit chaotic for most of us and as it was quite a long game, it hasn't made it back to the table since. It seems that even in the early days our taste for slightly more serious Euro-type games was already there. The last game of that second meeting was Niagara. 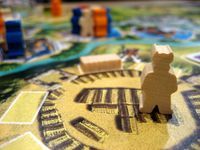 We all like Niagara and have played in several times since, however, not on games night. 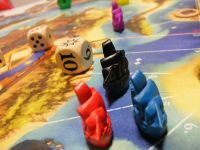 Like Jamaica, it fits that role of "slightly lighter game ideal for new players" and we are saving it for a suitable occasion. 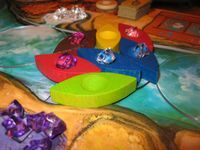 This was the first time we played one of our more popular filler games. 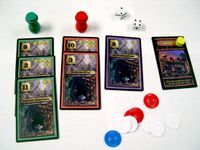 It is really easy to teach, really quick to play and there is just a little bit of strategy mixed up in all the luck. This was the Feature Game for our third meeting and has also had an outing since. We really like it as it has "newbie appeal" as well as being a "proper game that gamers don't mind playing". Unfortunately, we have the "big box" version, which isn't very amenable to being carried about. This was the third game of a four game session session, though admittedly, two of the games were very quick. Perhaps it was symptomatic of us finding out feet, but this didn't really go down as well as some of the others and hasn't been tried again since, though it probably deserves a second chance. This was the last game played that night and also wasn't a great hit though this was probably at least partly because it wasn't explained very well and the track was a little long. Like Boomtown, it probably deserves a second chance really. This was really the first of the more serious, strategic games and that's reflected in the fact that we only played two games that night. It was new to two of us, but we really enjoyed it. It's been on the list to get back on the table for some time, but somehow just hasn't happened yet. We only had time for two games that night and the second was our Feature Game, Bohnanza. 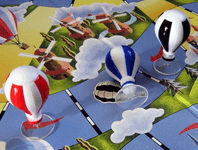 This is another game that we've played a few times and its wider popularity seems to be reflected both within the group and with family and friends who seem unable to get enough of "The Bean Game". This is just a quick 2-player game that we managed to squeeze in because a couple of us arrived early. 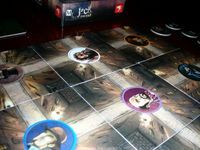 We only played it the once (though it was a Feature Game), and although most people seemed to really enjoy it, one of our players really doesn't like it, so it isn't likely to get much table time while the group remains small. 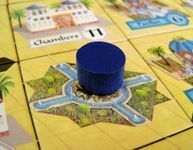 It is strange this one hasn't seen more table time, however, there are probably better games to fill the same niche. Played with a lot of people this is a bit random, but with three it should be ideal. This was the first outing of the second of our most popular fillers. It even made an appearance at our village Fete! Freezing fog, work and family commitments meant everyone was late or absent, so we launched straight into this one once everyone had finished moaning about the weather. This first time out it was the Feature Game, but we've played it since and probably will again. 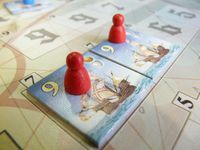 This is a game that is often describes as "being a bit like Ticket to Ride", however, in reality it’s nothing like it and probably has more in common with games like Elfenroads or Elfenland. 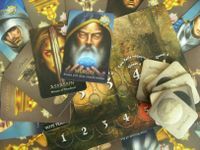 We liked it, but obviously not enough to play it a second time! With Christmas day and New Years day both falling on a Tuesday (and players valuing playing games with their family more than with other GOATS – can’t imagine why!) we decided to have an extraordinary meeting on the Thursday, which meant we had some visitors. One of them brought this game which was his Christmas present; we liked it, but not enough to go out and buy it. This was another Christmas pressie and is a really great game - we all had a ball playing it. It is very heavy though and it's owner is reluctant to carry it about on the off-chance that it will get played. It also needs a large table and it would be a bit tight now that we are forced to meet in private houses. We really like this game, but only in the right circumstances, which is probably why it has only had the one outing. Last game of the evening was Dobble. This is a fun little filler with the same mechanic as Eketorp, but seemed less divisive. We should probably play it again. Ticket to Ride is generally very popular with family and friends, so we thought it would make an ideal "Feature Game". This time we played it with the 6-player Team Asia map, which was new to almost everyone. A few months later we tried making it a Feature Game again a couple of times, but since the new people we were expecting didn't show up we didn't play it. It seems that for experienced gamers there are just more interesting things about to play these days. The last game of the night was No Thanks!. 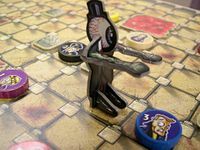 There weren't very many of us when we played Tutto, and we felt that if there were a lot of us there would be a lot of downtime, so it hasn't seen the table since. This one is a funny one, it was a Christmas present and should have been a good game for us, however, it didn't really hit the spot somehow. We tried it again a few months later and we mostly decided we weren't keen to give it a third try.